Alice is a doctoral student in modern British history. Her research focuses on the relationship between media technologies and imperialism in the British Empire during the late nineteenth and early twentieth centuries. She is also interested in information studies, commodity circulation, and histories of science in British and British imperial contexts. 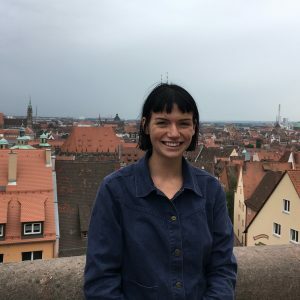 At Columbia, she is part of the New York – Cambridge Training Collaboration (NYCTC), which connects PhD students and faculty working in the field of twentieth-century British history from across three institutions. Prior to starting graduate school, Alice completed her B.A. in history at the University of British Columbia, where she wrote her undergraduate Honors thesis on masculinity, settler colonialism, and the politics of leisure during British Columbia’s early gold rushes (1858-1871).